“a Lamp to my feet. a Light for my path.” – Matthew 7:15 | A LAMP TO MY FEET. A LIGHT FOR MY PATH. False prophets know that the ears of many will gladly listen to, and also pay for, doctrines and practices offering spiritual enlightenment which suits their lifestyle and also allows them to pursue their own desires. 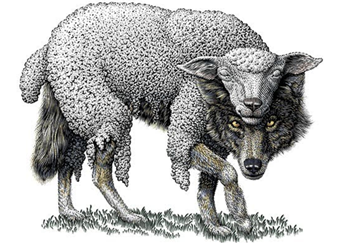 These false teachers of liberal, soothing and flattering doctrines, come in sheep’s clothing, with a virtuous, gentle and plausible exterior, and always with the welcome news that the “gate” is not so narrow after all. They are ferocious wolves, because they are focused on separating the flock from the One True God, and bent on devouring it for their own ends. and I thank You for Your unending Love for me. and for dying on the Cross for me. and from doctrines which seek to seduce me away from the only Truth.